I am launching a new series of DC Eats and Food. I am also inaugurating with it, My Lunches with Jeanne, who might or might not be a figment of my imagination. My treiff, unkosher, alter ego, with a direct quote "we eat a lot of pork. I looooove pork." Preaching to the choir, NOT. She might or might not have gone to graduate school with Jonathan. If she is real, Jeanne might not be her real name but a pseudonym. She might or might not chime in here. Maybe by a lucky chance she will even write an entire post, as long as the muse strikes her and it is not too much work, and that too is a direct quote. We ended up completely out of my comfort zone at an authentic Chinese restaurant, in an indistinct tiny strip mall. 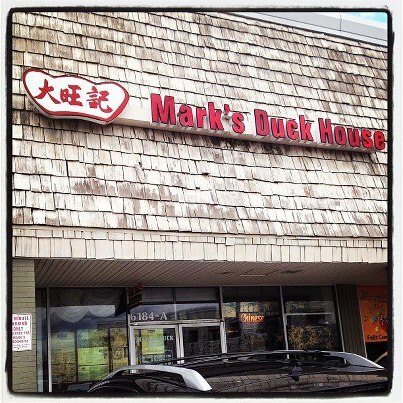 A place called Mark's Duck House. They greeted Jeanne warmly. The trolleys, as I called the carts, were rolled to our table by the servers as soon as we were seated. I believe dinner is a la carte. Jeanne quickly conversed with them, in Mandarin, and pointed to the desired dishes. They immediately unburdened the carts and our table quickly became crowded. One trolley was ladened with an array of dumplings of all shapes, pleated to perfection. The other with duck and other non dumpling offerings, like baked sweet pork buns. Jeanne mentioned how each particular type of dumpling has its own corresponding shape and pleating. It's an art. The on the bone Cantonese duck was superb. Moist, flavorful and roasted to mahogany perfection. There were rice noodles that reminded me of Vietnamese food. More subtle, sophisticated flavors than the greasy, sweet and sour sauces in dishes I had in other Chinese establishments. Of course I was taken by that one dumpling that had some cilantro in it, or I though it did. Loved the Chinese broccoli, beautifully piled up in a rectangular brick presentation with some sauce. Honestly, if you eat anything seafood and pork, this is your Chinese heaven on earth. Here, you can't go wrong. I warmly recommend it; to me it was a culinary adventure. Disclaimer: I do not get comped by restaurants or their PR agencies to write these posts. I foot the bill myself. I will share only places I love. This series will be snapped with my iPhone. 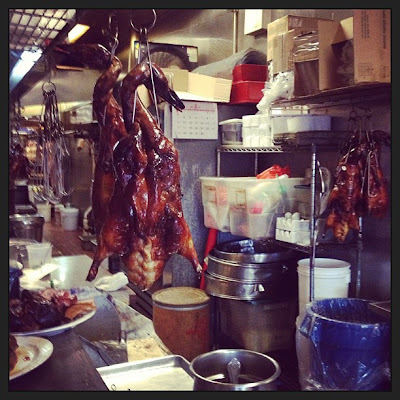 Oh, I love Cantonese duck! This place sounds great. I usually like the crispy duck. This is the first time I had Cantonese and I liked it a lot. Oh yum! Now I'm totally wishing I could go out to lunch today. What a fun new series. I've just finished breakfast (and I'm already hungry again!) That duck sounds so good! Thank you for sharing, sweet friend! I hope you are having a warm end to your week. What a super fun series you launched here. I'm dying to know who inspired Jeanne! :)Sounds like a delicious place I'd love to visit.